Just the other day, I was mentioning on one of the knitting groups how we end up with babies around our family and friends. It's not the water that they're drinking I said. It was how big my pile of baby things were that I had already knitted up. Alli thought that was funny. Alli-you're going to love this one. I was only thinking about making a Beribboned Sweater this time!I.HADN'T.STARTED.KNITTING.YET! when these two requests were made! Guess I have to shush up about what I want to knit now, BEFORE the babies start popping out! 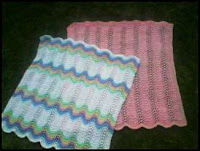 The pictures I have of this blanket, again are knitted up in RH's TLC Lustre. It's no longer being made, but Caron's Simply Soft is similar in softness and it's a worsted weight. I've also made this in a single color. I'm thinking any worsted or aran weight would be fine with this pattern. I'm hoping to make one out of Encore Colorspun one of these days soon. But middle daughter only wants the Rainbow version. That does make it easier when you don't know if it's a boy or girl, I guess. One time I was on an airplane knitting away on one of these blankets. The flight attendants were full of compliments and I knitted away. One of them told me that she'd just started knitting, and had never done any lace work. Well, this feather and fan pattern is one of the easiest lace patterns I've ever known! In the middle of the flight while the other flight attendants sat and pulled out their favorite books, she came back and I taught her YO's and K2Tog's. Then I wrote out the pattern for the blanket and a couple of other things using the stitch pattern for her. She was so tickled that something that looks so hard, was so easy, and she had learned to make it!. A couple of months later, I got a really great box in the mail. One of her regular routes is to Germany. She sent me a box full of sock yarns from GERMANY! Now, that's a bonus for flying! I was just happy to have spent some time teaching her something I enjoy so greatly. her gift really surprised me! If you wish to make the blanket into a rectangular shape, please purchase extra yarn for the added length. Because NMCRS wants the blankets that I make for them to be square, I write my patterns for the square sizes. By no means should you limit your blankets to my color choices or my stripe patterns. Experiment as always...and make them your own 'flavor'. About the length of the circular needles. I like longer circulars when I'm making blankets and afghans. I like to be able to smooth out my project and visually check the patterns while I'm working. There are several ladies in the yarn shop I like to go to, that use 29" lengths for full sized afghans. It's really up to you and your personal preference. Just like brand of needles, so too is the choice of length you will prefer to use. If you have any questions, email me at: bruinmom99 (at) yahoo (dot) com for help. Please make sure you put something in the subject line so I know that you're not spam. Yahoo mail has been filled with soooooooooo much spam lately! ULG! Can put folks up in space and on the moon, but we can't stop spam! TLC luster yarn…1 (5 oz.) skein each of lt. blue, lavender, pink, yellow, mint, 3 skeins of white; or 4 skeins of any one solid color. Using white and size (US) 9 (5.5mm) needles, cast on 154 stitches with a cable cast on. Knit 6 rows, slipping the first stitch of each row for a smooth border edge. Knit each row back and forth, do NOT join. 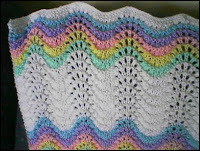 Change to size (US) 10 (6mm) needles and begin pattern, still using white. Row 1: Sl 1, knit across row. Row 3: Sl 1, K4, *(K2tog) 3 times, (K1, YO) 6 times, (K2tog) 3 times*, repeat between * *’s 8 times; K5. Row 4: Sl 1, Knit across row. Continuing with white, change back to size 9 (5.5mm) needles. K 7 rows, slipping the first stitch of each row. Bind Off in purl. Weave in ends using a tapestry needle. Thanks for sharing your pattern.. Thank you Penny! I appreciate it a lot. And you're most welcomed! 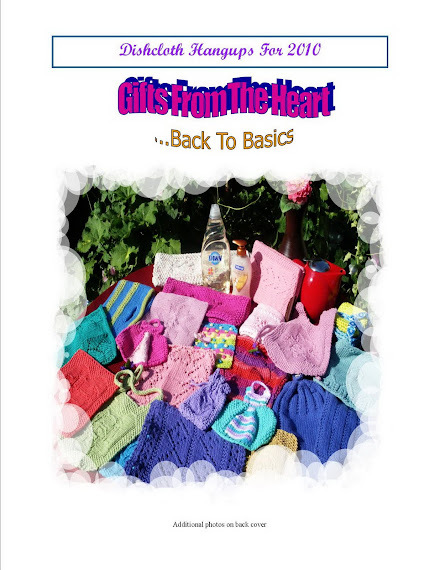 I've been given a lot on my road to knitting knowledge, and I'm happy to give back! Thanks for sharing this pattern. My 5-year-old son has his heart set on a blanket with many colors. He wants one with his favorite color and all the favorite colors of his family (brother, mom and dad). This is perfect, and he loved your pictures! It will make a nice blanket for him to keep for many years. thanks for sharing this~ my daughter's preemie daughter will look sweet in it! 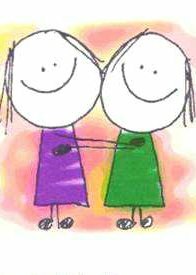 I lost this pattern many moons ago, Cathy, so I thank you for sharing it with us. So glad you liked it! Enjoy! 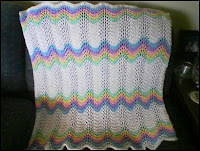 this is great, thanks a ton, I am doing it in Bernat Baby Coordinates, Pink and Purple candy stripe, it should do a self striping type pattern, I will send you a photo on rav. Cathy, thank you for sharing this pattern! It is beautiful and I am excited to start it in one color. We'll find out Tuesday if it's to be pink or blue! Enjoy either color! And enjoy even more, when you can wrap a little one in it. Enjoy all the hours of snuggles! I believe I'm following the pattern as written and keep ending up with a ton of extra stitches after the first pattern row of decreases and increases. Any suggestions? First of all, count, count, count while you're knitting across. Second of all, be certain with your yo's you're only adding one loop at a time. Third, make sure you're doing the corresponding decreases. To maintain your counts, you have to increase as many as you decrease to keep the same stitch count. Good luck! Hi. Beautiful blanket. Thanks for sharing. Do you have a printable version? Or a PDF downloadable so I can send to Kindle? Thanks! Just what I was looking for. Tks. And tks for your instructions to use a thinner needle for cast on (I hate it how it looks without that). Explanations are clear and the blanket you knitted is really beautiful. Thank you so much for this lovely pattern. 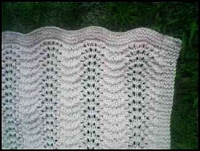 So many babies and some adults too have enjoyed a blanket with this pattern, all happy and me too, as I've enjoyed it very much!!!! Try as I might I just can't work out how to increase this pattern..just want to add another couple of repeats to make it a bit wider. Please help me!! Dear anonymous: This is an 18 st repeat pattern. After you know the gauge you are using with the needles and yarn you choose, you'll be able to measure how wide and long you want to make your afghan. Increase in increments of 18 until you can reach your desired width. Knit until you reach the length you are looking for. But make certain you buy enough yarn to add the additional size you are then creating. I wish you enjoyment with your project. Relax your bind off and don't make it too tight. You may have to play with it to curve it into shape. Remember the weight of the blanket has been pulling it from your needles. And not allowing it to curve while working the project. Here's where using animal fibers and blocking would make a huge difference. Since I tend to use acrylic for easy of care for new Mommas I don't stress over it much. After all you should see what my Grandson has done to his blanket while loving it for two + years now! Cathy I have struggled with the amount of stitches to use. I have counted them many times and get a different number most of the time. I refuse to let it get the better of me, so I have tried a smaller needle and increased the stitches to make up for the smaller needle. The pattern says there is an 18 stitch repeat. Count as I might I don’t get the 18 stitches. I am an older woman and have knitted since I was about 8 years old and have never been stumped like this. Am I loosing it or is it just old age? Ps this is the fourth time I have ripped it out. Dedicated yes!! Thanks for listening. This is the section you need to repeat. (K2tog) 3 times starts with 6 sts.